Matt loves cooking over a wood fire. He really loves doing french toast over the fire, but we haven't had a chance to do that in a while. The last time was on a camping trip with Matt's siblings a little over 3 years ago. French toast and maple syrup are great over a fire! It adds that very slight smoky background. 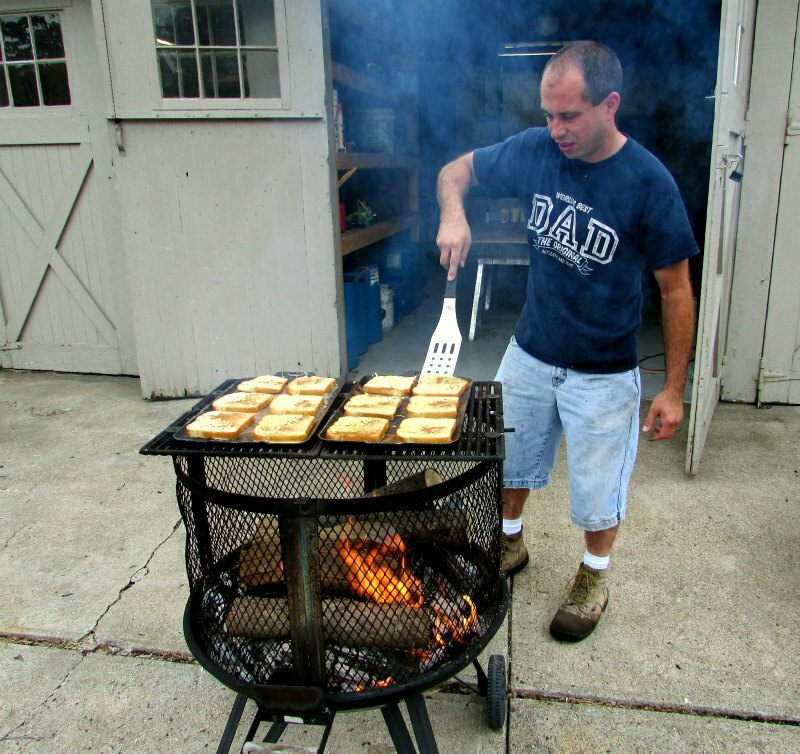 I knew both of our dads would love having a campfire breakfast, so I have been planning to do it for Father's Day for a few years now. However, life keeps getting in the way and we haven't had the chance to follow through. Matt did a great job of building and manning the fire. He was able to cook a dozen pieces at a time! 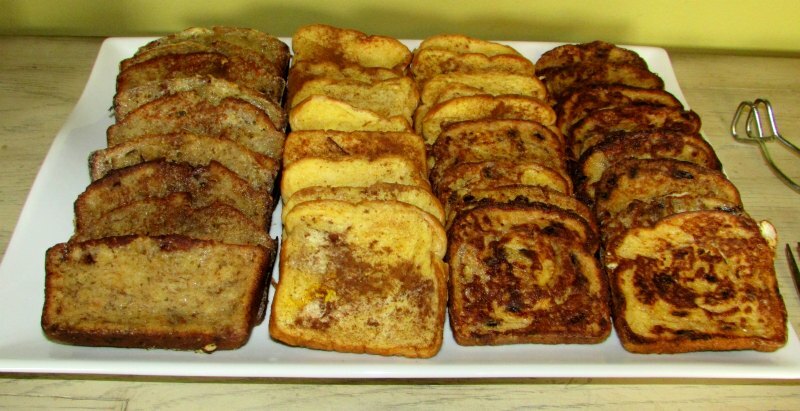 The french toast cooked quickly, so before long we had a platter of three kinds of delicious french toast! We had banana bread french toast, Matt's specialty french toast (white bread with vanilla and cinnamon), and cinnamon raisin bread french toast. I made a fresh strawberry puree if people wanted a fruity topping. Matt prefers his with butter, granulated sugar and maple syrup, so those options were all available as well. Of course there was bacon, sausage and fruit salad as well. 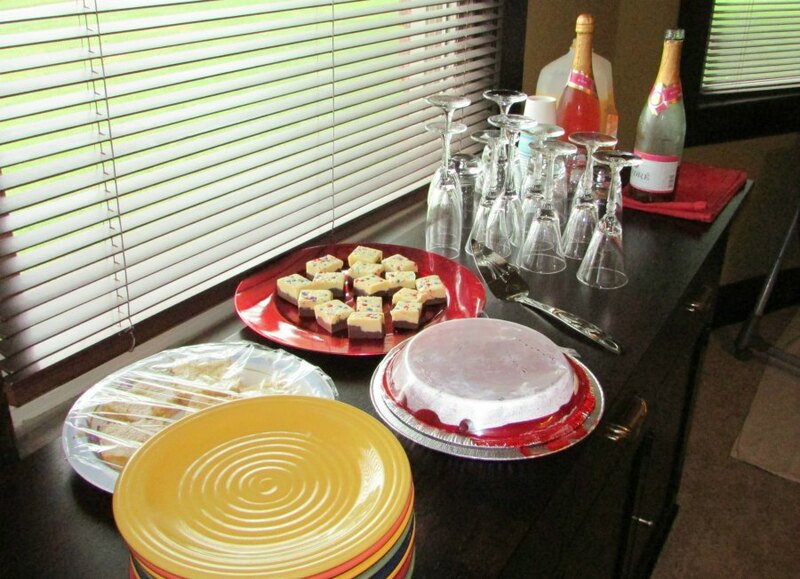 Also available were lemon bars, strawberry no bake cheesecake, fudge, mimosas and coffee. All in all, I think everyone was able to find something to fill their tummies. It is always fun to get together and catch up. Matt also cooked dinner over the fire. I'll give you a sneak peek, but I am sure more details will come later! Any day that involves every meal being cooked over a fire is a good one for Matt. Especially if one of those meals includes as many shrimp as he could possibly eat. I hope all of the fathers had a great day. We had a really nice one. Jax loves tagging along with his daddy, uncles, grandpas and gimme (my grandpa). So he likes father day as well! Labels: Breakfast, Get Grillin', Party! I'm glad you had a great Father's Day. Thank you! Matt really loves french toast on the fire and he had fun cooking for everyone. I hope you had a great weekend! We're going camping next month, and I think it would be fun to make this for our crowd. They're going to love it! Thanks for the inspiration! 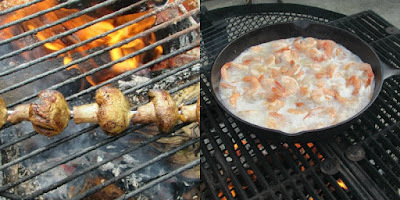 Based on the looks of your food and desserts, ya'll had a great Father's Day weekend! I hope everyone loves it! Matt's campfire breakfasts are one of my favorite parts of camping. We had a great Father's Day, I hope you did as well. That looks amazing! I have never heard of doing french toast over the fire, but I am going to try it now! We really enjoy it this way. It add just a little grilled flavor that goes great with the maple syrup! That is such a great idea! Must have been a great breakfast buffet! We had a lot of fun doing it. I don't think anyone went home hungry! Yum! I love banana bread French Toast, but have not yet made it at home and have never made any type on a grill, what a fun idea and sounds like a great meal! Thank you! Matt really enjoys cooking anything over a fire, so he was really in his element. Have a great weekend! Hopefully soon! 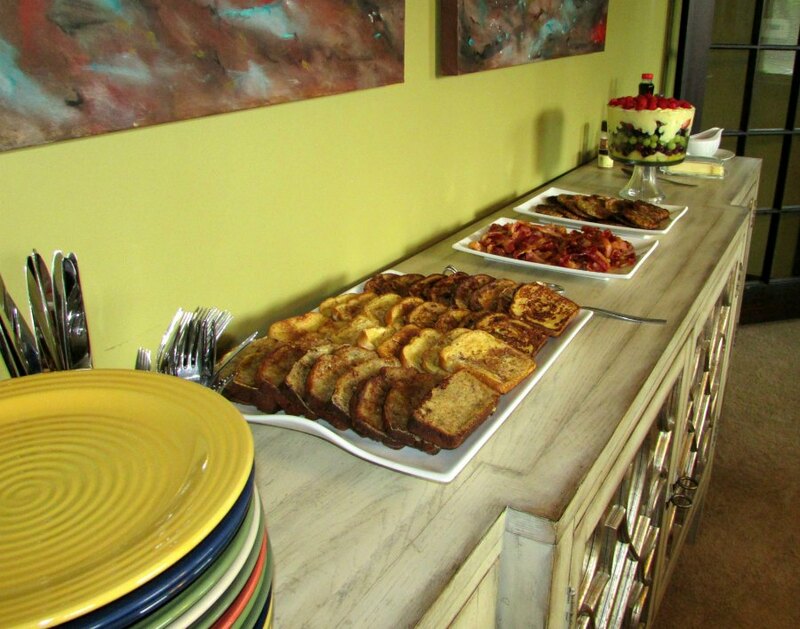 We think it would be fun to do a fireside breakfast for our friends too. The trick is getting them to wake up early enough for breakfast ;-) You are more than welcome!! Looks delicious! Your recipes are amazing! Great job! French Toast over fire? Why didn't I think of that?? Genius! Can't wait to try this on our new grill! Thanks for sharing with Inspiration Thursday. Hope to see you next week. We love it this way, the fire definitely adds just a little different flavor. We had a lot of fun treating our dads to a fun campfire breakfast. Thanks for stopping by, see you next week! Thank you! We had a really good time. We love being able to get everyone together. Thanks for hosting! 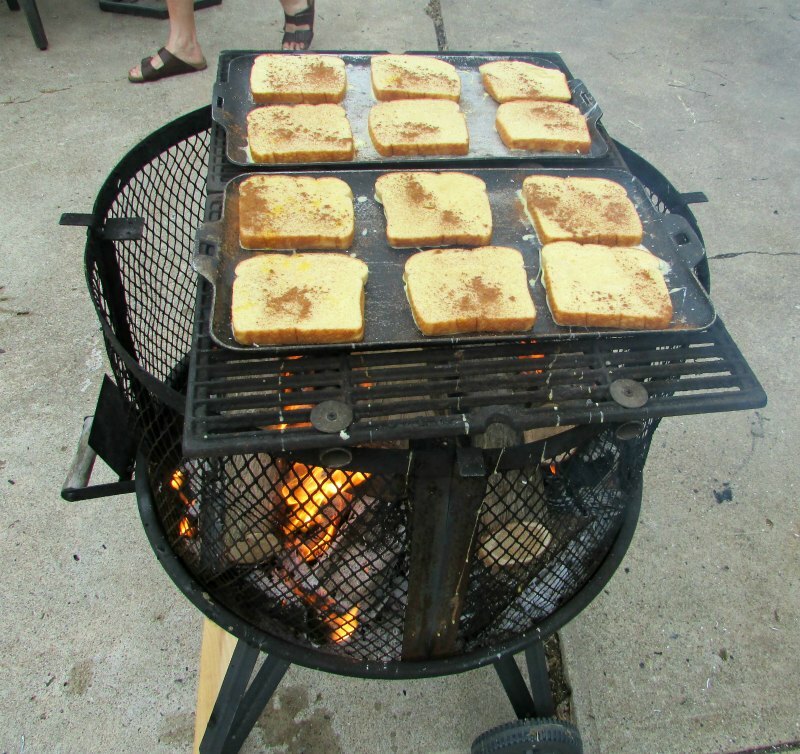 I have never seen French toast done like this on an open fire, but I think it would be a great idea for camping. Thank you for sharing with the Clever Chicks Blog Hop! I hope you’ll join us again next week! It's Matt's claim to fame! We really enjoy it that way. Thank you for hosting, see you next week! That looks wonderful! Thanks so much for sharing it at last week's Tips & Tricks. Hope to see you this week, again! (The party just went live - www.stringtownhome.net)... I'm heading over to pin this post, now! :) Thanks again for sharing it with us..
We had the best time. Matt loves cooking over the fire, so he was in his element. Cooking things that way always gives them that little something extra! Thanks for hosting! Yum! What a great Day! Thanks for sharing on My 2 Favorite Things on Thursday!! Hope to see you again tomorrow!! Pinned!